Historically, traditional music radio didn't worry about how to manage multiple songs by hot artists. The record companies would release a single, if the stations' programming directors thought those songs were hits, they'd play them until that song ran through its popularity lifecycle; then the record company would release the artist's next single. It was a comfortable process - one that followed a process and it worked. On-demand streaming has changed all that. My company, Bridge Ratings Media Research, has been providing on-demand streaming data to radio stations, internet radio and record labels for over four years. During that time we've learned much about music consumption and how radio can properly reflect audience tastes. After an analysis of four major radio formats (Top 40, Country, Urban, Rock) in 143 markets, it is clear that radio is not reflecting the streaming consumption patterns of its listeners. But when labels and/or artists drop multiple tracks within a short period of time, radio struggles to properly expose that music to keep up with the audience consumption of those songs. Drake, Taylor Swift, Big Sean, Kendrick Lamar, Imagine Dragons, Thomas Rhett and many other artists have several songs from new releases all over our streaming charts. And radio can't manage the volume. As of the writing of this article, Taylor Swift released two songs from her forthcoming November 2017 release, "Reputation". "...Ready for It?" and "Look What You Made Me Do" were released within a week of each other and they are already ranked #1 and #2 on our Top 40 and Adult Contemporary streaming charts. When the full album is released in November, multiple tracks will fill the top chart positions on multiple charts. This information reflects actual listener consumption. Meanwhile, radio's antiquated exposure systems cannot accommodate such overload. Imagine Dragons' huge 2017 album "Evolve" after many weeks continues to be a streaming favorite with "Believer" crossing over to multiple formats (Alternative, CHR, AC). The song has far outdistanced the number two song on Bridge Ratings' Alternative streaming chart generally garnering 40% more streams in most weeks. And radio is all over that song. But there are five additional tracks that are suitable for Alternative, Top 40 and Adult Contemporary that are getting little or no play. "Thunder" has proven to be a worthy follow-up to "Believer", however "Whatever It Takes", "Rise Up" and "Walking the Wire" are also residing in the top 30 most-streamed New alternative rock charts. In a 2017 study Bridge Ratings asked users of on-demand streaming services like Spotify, YouTube and Apple Music" who also listen to traditional radio why they listen to those services and how their radio listening has changed. How to read: 84% of our sample of 2200 streaming and radio listeniers agreed with the statement I listen to streaming music services over AM/FM radio becase "I can choose what to listen to and when." Note: Due to contractual agreements with the client who commissioned this study, some charts have been omitted including "Music Streaming Preferences-Dislikes/Negatives." The primary reason our sample prefers streaming music services is their ability to listen to whatever they want whenever they want. 84% agreed with this statement. Variety (78%) was next and, understandably, "Perfectly matches my music preferences" was third (65%). At #4 on this list, "To hear more songs by my favorite artists", a majority agreed with this statement which is also reflected in our "Radio Listening Negatives" chart. This is the first time since we've been measuring music streaming consumption behavior that we have seen this response ranked this high. Reasons to like traditional radio have not changed all that much over the years with "Ease of Use", "Companionship" and "Local Information" typically scoring in the top 5. How to read: 75% of our sample agrees with the statement "When you have a choice, why do you listen to music on AM/FM radio?" The fourth most-agreed to response is also new: "I want someone else to choose the music for me". Bridge Ratings' studies have been picking up on this preference point in the last twelve months as on-demand streaming has become a universal entertainment behavior. Sometimes the public prefers the radio station to organize and arrange music play for them. Chalk this up to decision stress when creating streaming playlists or even laziness; radio serves an important alternative role for music consumers. How to read: 95% of Streaming partisans and 84% of radio partisans when responding to the question "Why are you listening to the radio less than you did six months ago." agree with the statement: "Can't customize/personalize what I hear." Our sample is divided into two sub-samples: partisans to traditional radio who listen to radio more than they do streaming services in a typical week and streaming partisans, those who spend more time with streaming services than radio in a typical week. As we move left to right, the differences between these two groups grows more vivid. Of the most-often mentioned reasons, "too many commercials" continues to plague an industry struggling with positive revenue growth in the face of the digital competition. 91% of radio partisans (primary fans) and 98% of streaming partisans site too many commercials as the number one reason they are listening to radio less compared to 6 months ago. 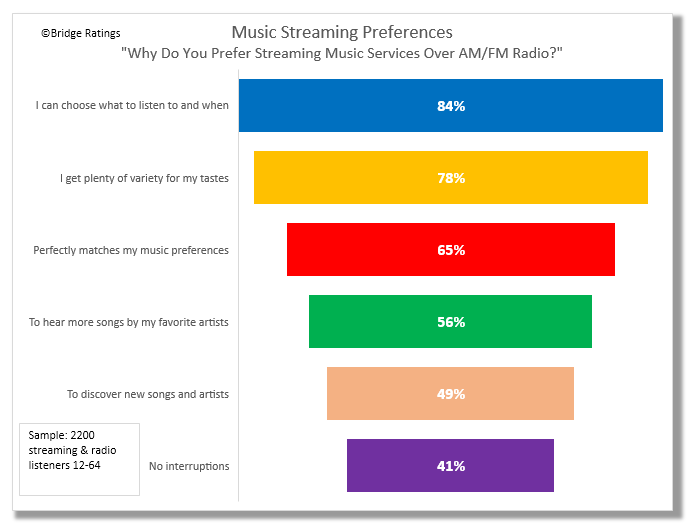 At the right end of the chart, the distinction between radio fans and streamies becomes very clear - and this is radio programmers' challenge: 90% of streaming partisans just don't hear as many songs by their favorite artists on traditional radio and this is a significant reason they choose music streaming services over radio. Even the majority of radio partisans (61%) agree with this statement. Traditional radio's challenges through the new media gauntlet over the last 17 years have been focused on time-spent-listening attrition. Initially, audio consumers' reduction in time-spent with traditional radio was partially based on the addition of new platforms which provided capabilities to customize audio content with no commercials. Starting in 2009, many of these new platforms perfected their content offerings through better ease of use or customization. Alongside these developments, artists and record companies were learning the capabilities of on-demand music streaming and how it could benefit sales or consumption. In recent years, artists have graduated from dropping individual songs for streaming to releasing multiple tracks or full albums all at once or in quick succession. Audiences quickly gravitated to the abundance of songs by their favorite artists building playlists or simply streaming many of these titles in heavy doses. This new behavior by on-demand streaming listeners has accelerated time-spent-listening attrition partially because radio has not been able to accommodate the volume of songs released by popular artists. Some of our clients in a variety of formats (Top 40, Country, Rock) have begun to figure this out by offering special programming that would dedicate full hours to exposing multiple tracks of only the most-streamed current releases. Audience response has been very favorable. One of our clients is trying something new: the creation of a new approach to the mechanics of exposing music formatically, increasing the number of different current songs by core artists. This new format approach may prove to be a way traditional radio can accommodate the volume of songs released by popular artists. The success of this new approach is still to be determined as audience ratings are just now beginning to reflect the changes. We will continue to watch on-demand streaming behavior so the radio industry can continue to mirror listener music consumption.